It might have come as a shock when you logged on, but you can see that Chronicling Elizabethtown has a new design. Thanks to the templates from Blogger, I found something that I think cleans up the design, makes it more current. 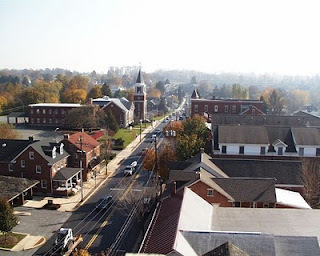 At its heart, though, it's still the same blog presenting the same information about Elizabethtown. I have to credit the staff at Elizabethtown Borough's office for taking and background photo and providing it for me to use. The view is looking south on Market Street from the steeple of the Elizabethtown First Church of God. Frankly, it's one of the best views of town I've seen.